Summary: Sweet potatoes are rich in carotenoids, pigmented substances that include vitamin A, lutein, and beta-carotene. These micronutrients have been shown to have anti-cancer activity in addition to other health benefits. In a population based study published in the International Journal of Cancer, researchers compared the diets of a large group of women who developed breast cancer against those who did not. 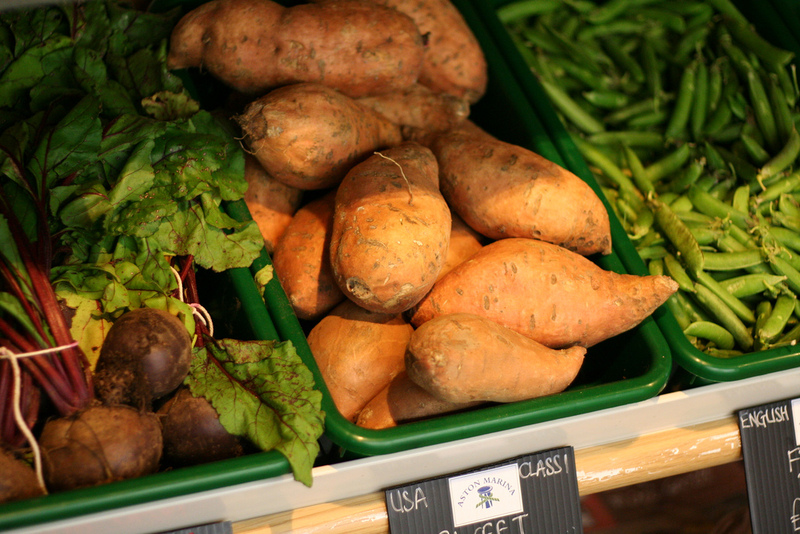 They found that premenopausal women who consumed high amounts of sweet potatoes and other fruits and vegetables rich in carotenoids had a significantly lower incidence of breast cancer compared with those who consumed the least. These findings are consistent with other observational studies and suggest that high consumption of carotenoids may reduce the risk of breast cancer among premenopausal women. Some studies have found a lower incidence of breast cancer among women who consume high amounts of fruits and vegetables rich in carotenoids, which include vitamin A, beta-carotene and lutein, among other nutrients. Carotenoids are present in copious amounts in yellow and orange fruits and vegetables and in dark green leafy vegetables, and are responsible for their vibrant coloring. Experimental studies suggest that carotenoids may suppress the development of cancer in several ways. Certain carotenoids have been shown to inhibit cell proliferation and also angiogenesis, the growth of tumor blood vessels. Dietary carotenoids have also been shown to suppress the stimulating effects of estrogen on breast cancer cell proliferation. A study published in the International Journal of Cancer recently examined the relationship between carotenoid intake and breast cancer risk. The study, called the Collaborative Breast Cancer Study (CBCS), compared the dietary and lifestyle habits of 5,707 women who developed invasive breast cancer against 6,389 women who did not. The women, who were between the ages of 20 and 69, answered detailed questions about their levels of consumption of carotenoid-rich foods in the preceding five years. Foods high in carotenoids included sweet potatoes, spinach, tomato sauce, orange juice, carrots, green beans, and a number of cruciferous vegetables, such as cauliflower, Brussels sprouts and broccoli. The carotenoid content of each food was estimated from a cooperative database of the U.S. Department of Agriculture-National Cancer Institute. Among the findings, premenopausal women who consumed two or more servings per day of carotenoid-rich fruits and vegetables had a significantly lower risk for invasive breast cancer than women who consumed fewer than four servings per week. Specifically, high intake of beta-carotene and vitamin A was associated with an almost 20% reduced incidence of breast cancer. Women who smoked had an even greater risk reduction—more than 20% for some carotenoids. In contrast, no benefit from vegetable-derived carotenoids was observed for postmenopausal women. The results of this case-control study are consistent with some, but not all, previous case-control and cohort studies showing a decreased risk of premenopausal breast cancer with increased intake of vitamin and beta-carotene. It is unclear why this benefit does not extend to postmenopausal women, but it may be related to the ability of carotenoids to interfere with estrogen-dependent tumor growth. A couple of limitations are worth noting. The study did not collect information on preparation and cooking methods, which can influence carotenoid levels in foods. It also lacked information on beta-carotene and vitamin A intake from nutritional supplements. Nonetheless, this study adds more evidence that carotenoids obtained from fruits and vegetables may lower the risk of breast cancer among younger women. Mignone LI, et al. Int J Cancer 2009;124:2929-2937.